When the normal political system fails, it’s time to act up! The massacre in Orlando, Florida, will haunt us for a long time. 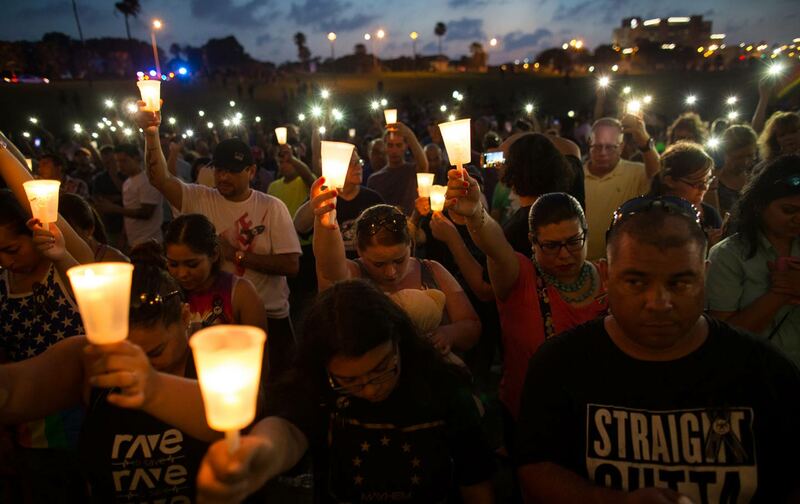 The worst mass shooting in modern American history took place at Pulse, a gay nightclub where patrons were enjoying “Latin Night” and also celebrating Pride Month. Forty-nine people were killed and another 53 wounded. Mostly Latino and LGBT, the dead include Franky Jimmy Dejesus Velazquez, a professional jíbaro dancer from Puerto Rico who at age 50 was the oldest victim, as well as Akyra Monet Murray, 18, the youngest. Murray had just graduated from high school and was looking forward to starting college on a full basketball scholarship. In between are 47 other beloved human beings—healthcare workers, veterans, cancer survivors, mothers, brothers, students, retail workers, girlfriends, boyfriends—whose loss is breaking someone’s heart right now. In contrast, the presumptive Republican nominee, Donald Trump, demonstrated once again that he is unfit not only to be president, but to possess any kind of leadership position whatsoever. While barely expressing sympathy for the victims, Trump bragged on Twitter that the attack proved the wisdom of his proposal to ban all Muslim immigrants to the United States—even though the perpetrator, Omar Mateen, was a natural-born American citizen. He called on President Obama to resign because he did not use the words “radical Islam” in the immediate aftermath, and went so far as to suggest that Obama had some kind of connection to the Orlando attack itself, presumably because Trump believes the president is a secret Muslim. In a terrifying speech, Trump launched blanket accusations at Muslims and claimed that the United States has “no real checks or scrutiny” for new immigrants (it does). When his conspiracy theories were challenged by The Washington Post, Trump banned the paper’s reporters from attending his events, as he has also done to journalists from BuzzFeed, The Huffington Post, Univision, The Daily Beast, and Politico—demonstrating that he truly intends to govern as a demagogue with contempt for the role of a free press in a democracy. Just as Americans stood up in solidarity with victims of the Orlando shooting, so too must we rise up to forcefully reject Trump’s divisive, hateful politics. As we go to press, investigators and the media are still piecing together details of Omar Mateen’s life. What has emerged so far is a murky and bewildering portrait. According to his father, Mateen was enraged by the sight of two men kissing in front of his wife and child, but he also regularly attended Pulse and was seen by its patrons on a gay-dating app. During the assault, Mateen called 911 and reportedly pledged allegiance to ISIS, but his past is checkered with false claims of affiliation with other extremists, from the Tsarnaev brothers to the Nusra Front to Hezbollah—suggesting a generalized and superficial interest in radical Islam. He was, his first wife reported, an angry, violent, and controlling man. We may never know what exact combination of homophobia, self-loathing, religious extremism, mental illness, and rage drove Mateen to do what he did—and in many ways, that is beside the point. The Orlando massacre was the 998th mass shooting in the United States (defined as incidents in which four or more people—excluding the shooter—are shot at the same time and place) since a gunman walked into Sandy Hook elementary school and killed 26 people on December 14, 2012. Only a handful of these attacks involved radical Islam or any discernible ideological motive whatsoever. Almost all of the shooters were men. But the common denominator in every single one of these incidents—as well as in the more than 10,000 gun deaths that take place in the United States each year—is guns. America has virtually as many guns as people, far exceeding any other country in the number of privately held firearms per capita. Completely unsurprisingly, our rate of gun-related homicides dwarfs that of comparable nations (six times Canada’s rate, 16 times Germany’s, 21 times Australia’s). As the president rightly pointed out, this situation is not an accident; it’s the desired outcome of our political process. Last month, three Harvard Business School professors published a stunning study showing that mass shootings do in fact precipitate policy changes. While the researchers found no significant effect on the passage of new laws in Democratic-controlled legislatures, they found that in Republican-controlled ones, “a mass shooting increases the number of enacted laws that loosen gun restrictions by 75 percent.” Yes, you read that correctly: Much like pressing one’s scorched hand down harder on a hot stove, our collective response to an epidemic of mass shootings has been to pass laws that further facilitate mass shootings. A political system that behaves in such a manner is fundamentally broken, and it must be reconstructed—now.